Okay. I am loving this board! This week, the goal is to use everything that we already have in the fridge and freezer. We did a little bit of meal prepping yesterday. My daughter loves to help in the kitchen so I like to include her in whatever I can in the cooking process. Yesterday I even let her help me chop. Which she really liked! So here is what we came up with for the week. So yesterday, we had a nice pot of sauce going all day. I even broke out the pasta maker and my little mini chef and I had fun “catching spaghetti” as she calls it. I love when I have the time (and energy ;)) to do these things. She is getting so good at everything! I usually make a big pot so I can freeze some and have it on hand when I need it but I didn’t this time. However, I did make the raviolis for Thursday’s dinner. So here is the lineup and proposed sides. Sunday – Sauce and fresh spaghetti. Good for the soul. Monday – Bacon and Eggs. Well… who doesn’t need an excuse for bacon and I love how easy breakfast for dinner is. Tuesday – Crab Sliders. I think I am going to make some asparagus with these because I see my menu is lacking green lately. 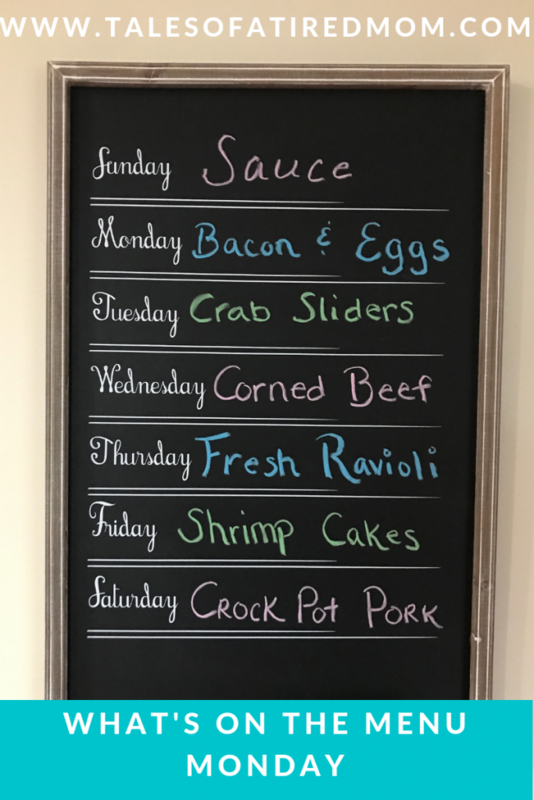 Wednesday – Corned Beef. Hoping to make some fresh bread and make a nice sandwich! Also, because my son is so picky but he loves fresh bread! Who doesn’t really? Thursday – Fresh Raviolis – Made the sauce and raviolis on Sunday, so that’s all done! Friday – OMG cheesy shrimp cakes! These are one of my favorites! And I definitely need to make a big salad with this because I think I carb loaded this week. WHOOPS. Saturday – Pulled BBQ Pork in the crock pot. Absolutely love crock pot recipes. And I think I will grab some clear coleslaw for this!